No 6 Squadron RAF was stationed in Mafraq from March to June, 1953, then returned in January 1954 to Amman when, on the 19th, King Hussein opened the new 2,600 yard runway by flying a circuit in his twin engined Dove. Vampires of No 6 Squadron flew a salute then four of them gave an aerobatic display to celebrate the occasion. In April 1954, 249 Squadron with Mk 9 Vampires arrived from Deversoir to Amman. The situation in Palestine necessitated an RAF squadron to be based in Amman giving RAF Air Headquarters in Iraq a DF/GA squadron. No 6 Squadron, this time equipped with Mk 4 Venoms, again visited Jordan in 1955 to relieve 249 briefly. RAF AHQ had three Venom squadrons in the area, which were at 48 hours notice to move to any other airfield in order to support Britain’s many defence agreements in the theatre. Until 1955 the Arab Legion Air Force was only equipped with non-jet aircraft. King Hussein knew that the Arab Legion would be exposed without adequate air support of its own and it was due to his initiative that the Air Force expanded and acquired jet aircraft. In September 1955 two DH Vampire T11 two seat jet trainers were purchased by Jordan and they spearheaded the arrival of ten FB Mk9 Vampire fighters, which were presented as a gift from Britain. 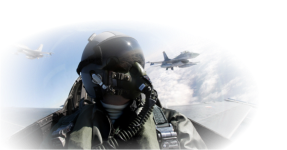 They formed the first fighter squadron. The first course on Vampires began in September 1955. To improve conversion training from the Chipmunks, three Harvard trainers were obtained from Kenya. The Jordanian pilots were trained on the Vampire jets by RAF instructors. 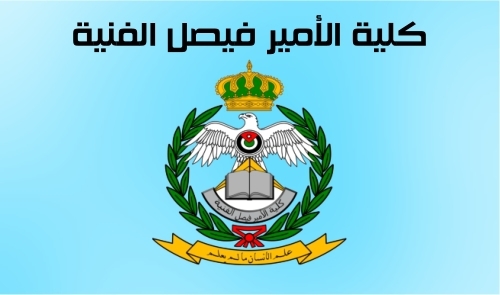 On September 25 1955 the Arab Legion Air Force was renamed the Royal Jordanian Air Force by Royal Decree and adopted a new design of the wings based on the RAF but with the Jordanian crown in the middle. The distinctive blue uniform, retaining army ranks and titles, was introduced in the same year, although khaki was still worn in the summer until the seventies. In April 1956, after the arabisation of the armed forces, Major Ibrahim Othman became the first Jordanian Air Force Commander, directly responsible to the Chief of the General Staff. 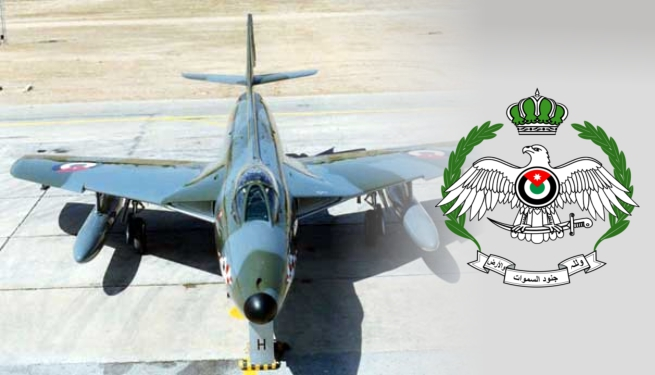 October 1958 saw the first two of twelve Hawker Hunter Mark 6 jet fighters land in Amman to form No 1 Hunter Squadron with the Vampires forming No 2 Squadron. The RAF was present in an advisory capacity and with a training team to instruct pilots and airmen on the Hunter aircraft. In June 1959, Mafraq was handed over to the RJAF with the first Hunter aircraft arriving there on that date. At the end of 1959 another squadron of Hunters was requested to replace the aging Vampires, but it was not until April 1962 that the first of these arrived to form No 2 Squadron at King Hussein Air Base Mafraq, replacing the Vampires which were then taken out of service, with the last flight on April 17 1962. In 1964 Nos 1 and 2 Squadrons joined to operate as No 1 Squadron. During 1964 the Hashemite Diamond aerobatics team was formed which consisted of nine Hunter aircraft and on October 19 all nine aircraft took off for the first time to practise together. The Diamond was formed in a record 11 days and performed their first show in front of King Hussein and members of the Royal Family on November 4 at Mafraq. On November 14 they performed two shows over Amman and Zerqa to celebrate the King’s birthday. The Diamond was reformed in May 1965 and flew three shows in June. This is the only nine aircraft aerobatic team formed in the Middle East to date.